The two box set-up boasts front and side speakers on the side of the main dock and a slim remote which is clear and allows easy switching of source input and iPod and iPhone controls. We used an iPhone 4S without any problems and the connectivity options will appeal to many users. While the two box set-up is built for home cinema and game console use, it can also double up as a desk system if you don't mind placing the subwoofer unit under a desk and feeling bass notes through your toes before your ears. Like the T12, the T9 sports the brand's Spatial Sound technology, which cuts out the traditional stereo 'sweet spot' so that the audio sounds the same, no matter where you are in the room. The Orbitsound T9 design is average in terms of style and is weirdly at odds with itself when it comes to the slim dock and chunky ( 230 mm x 139 mm x 355 mm) subwoofer. The removable grill reveals the speaker cones and while the subwoofer is as plain as your washing machine, it's simple enough to fade into the background if you have a discreet corner to hide it. The main dock itself is innovatative in the way it crams in side firing speakers to simulate surround sound. The whole set-up comes in black or white, designed to match your current set-up. The great benefit of a soundbar at this price point is the connectivity options. You can take a digital optical feed from your TV, games console or Blu-ray player via the chunky and rather impressive optical lead in the box. Your iPod sits in the dedicated dock and there's even room to connect anything else with a headphone socket if you invest in a £10 phono to headphone cable. There's no HDMI port, but obviously this helps to keep the cost down and it's something that Orbitsound tells us will be featured on products in the future. In terms of pure tech, there's a powerful 140 watt system split across the mighty 80 watt subwoofer and slender dock. Inside the dock, two 2.5 inch drivers lead the sound accompanied by a 1 inch tweeter and 2 x 1 inch drivers which push sound sideways and give a full sound. Connecting the Orbitsound T9 to a Sky HD box and watching the opening car chase scene of Quantum of Solace prompts a massive amount of bass from the start. Dialogue is detailed and clear but becomes slightly muffled in hectic action scenes compared to soundbars with a much bigger price tag. Clever placement of the dock and subwoofer can help things and there's useful bass and treble controls which calm the bass down and offer a more balanced performance. 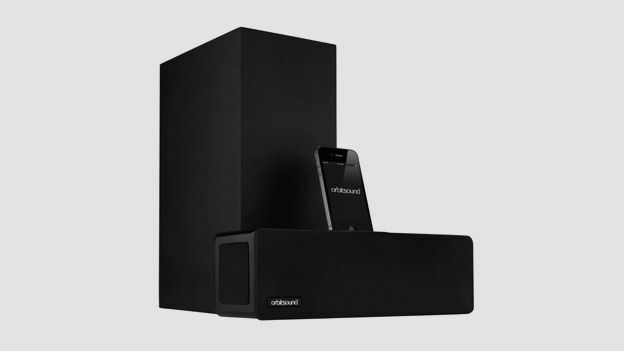 Plug in an iPhone and the Orbitsound offers a good, bass heavy party sound, larger than mid-sized dock systems and will have a better stab at filling the room from all angles thanks to the speaker set-up. Watching BBC News can prove a tiring listen but feed the Orbitsound T9 the sounds of Halo:Reach and the room filling sound instantly becomes obvious and beneficial at the same time. It's never going to offer the last word in detail but for size and scope, the Orbitsound T9 gives games and movies a great boost on a budget. There's nothing particularly new about the Orbitsound T9 design or approach but that price tag instantly throws a dedicated iPod dock purchase into question. It's not as simple or as stylish as a traditional sound bar that sits on or under your TV but they don't offer the bass or pseudo surround sound that the Orbitsound T9 manages for half the price. If you want a cheap and easy upgrade for games and movies, you'll be impressed and have a system that has the necessary grunt for a full-on house party too. As long as you can place the subwoofer discretely near a wall and don't terrify the girlfriend, cat or neighbours with your new found dubstep sound system, you'll have a great budget home cinema set-up.